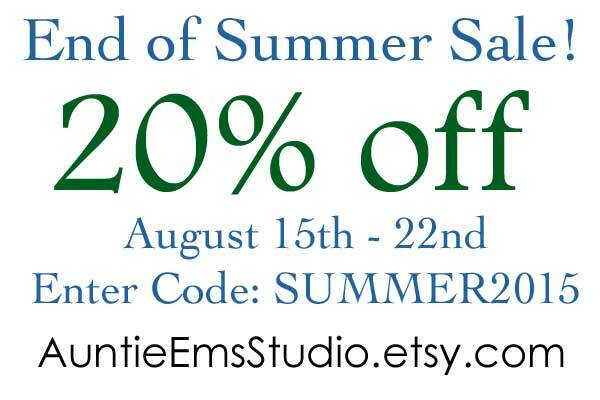 Auntie Em's Studio: Summer Sale! I'm having sales in both my Etsy shop and my Ravelry store! If you need some adorable knitted animals or accessories, check out my Etsy shop. All items are 20% off this week! Do some back to school shopping, or get a jump on some Christmas shopping. I currently have lots of items to choose from including several colors of T-Rex toys, lots of block set options, lace covered vases, hair clips and more! There are also a few items already marked down for even better savings! 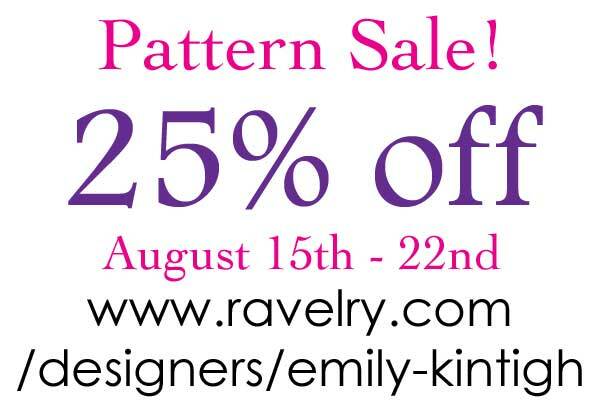 If you are a knitter and want to try out some of my lovely patterns, everything in my Ravelry store is on sale for 25% off! There are several toy patterns available including the T-Rex, Football and Puppy Dog Playset as well as my Classic Christmas Stocking pattern. It's time to start thinking about Christmas knitting and many of my patterns make great gifts. No coupon code needed, simply place the patterns you want in your cart and check out! I hope that you are all having a wonderful summer! Happy shopping!